...with no details about how a June convention is even logistically possible in the context of a primary calendar that stretches into that month? The draws of an early convention are obvious. Candidates, nay, presumptive nominees, can make the financial transition to the general election warchest. That can be a big deal for said nominee following what may be a moderately to very difficult nomination race that has run deep into the well of primary phase money. This makes sense. But the drawbacks -- or more appropriately the political and structural impediments -- to shifting up a convention to that early a point are quite onerous. Again, recall that the Republican autopsy of the 2012 election and the primary process -- the Growth and Opportunity Project Report -- mentioned that a nominee needs "an estimated 60-90 days to prepare for the Convention". That is, there should be 60-90 days between the conclusion of the delegate selection process and any subsequent national convention. Even a late June convention means that delegate selection will have had to run its course in all states two to three months in advance. In the best case -- 60 day -- scenario, that's some time in April. "If the Convention were to be held in July, the last primary would need to be held no later than May 15. If the Convention were to be held in late June, the final primary would need to be held no later than April 30. Moving primaries up will require states and state parties to cooperate." FHQ is less concerned with those date thresholds, but that last statement is noteworthy. Moving primaries up will require states and state parties to cooperate. Does that mean the same states and state parties that have cooperated in the post-reform era in not moving up to non-compliant dates on the front end of the calendar? Actually it does not. The rogue states have been the same cast of characters for quite a while. By now, regular readers here can reel them off from memory quite quickly. And Arizona, Delaware, Florida, and Michigan are not really the ones the RNC needs to worry about. They are already compliant with not being in that April to June window that would be problematic for a June convention. No, the states that litter the latter part of the primary calendar are a different lot and offer a different set of issues. ...all while potentially facing the same sort of penalties that have dogged the rogue states challenging the early end of the calendar. For starters, there are partisan concerns. 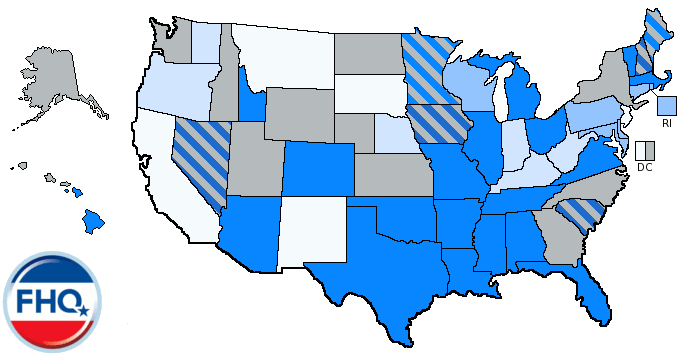 California and New Jersey -- two states that dropped early and separate presidential primaries in favor of later (June) consolidated primaries in 2012 -- strike FHQ as states not necessarily willing to budge on the move in the future. That may or may not have anything to do with the inertia of making yet another change, but it will certainly have something to do with which party is in control of the date-setting apparatus in those states. In the Golden state, Democrats maintain unified control of the legislature and the governor's mansion and will not shift the date unless there is some clear benefit to the Democratic Party or one or more of the potential Democratic candidates.1 An RNC directive will not do much to move that needle. A similar DNC measure may affect some change in California and other Democratic controlled states at the back of the calendar queue. Granted, Democrats are not necessarily high on the idea of a June convention. Folks FHQ has chatted with in the DNC are willing to go along an earlier convention, but not as early as June. Those sorts of partisan divisions -- or lack of unified control -- now exist not only in California and New Jersey but in New Mexico, Montana, Arkansas, West Virginia, Oregon and Kentucky among the May and June states alone. That could be problematic if the end goal for the RNC is a June primary. But let's assume for a moment that those states look more like, say, South Dakota after midterm or state elections in 2014 or 2015. That is, they are controlled by Republicans. That rids the national party of a political problem but does not erase a very real structural one. Revisit that California/New Jersey discussion above. The issues in those states were a combination of partisan and structural. 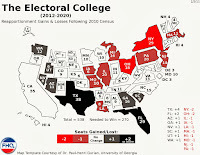 Beyond the partisan complications that we have assumed away in this thought experiment, there is some benefit to pretty much every state at the end of the calendar having consolidated primaries -- combined presidential, state and local primaries. Altering that structure would mean moving everything up -- presidential, state and local -- or creating and shifting up a separate presidential contest like what North Carolina did just this past week. The former is something that state legislators of all partisan stripes are not always open to. It affects their reelections whether a threat exists affecting those chances or not. The system has worked for those legislators in winning office one or more times in the past. Why change it? In other words, if it ain't broke, don't fix it. The alternative is to create and fund a separate presidential primary election. Not every state requires the $100 million it takes to fund such a contest in California, but state governments are not racing to expend multiple millions of dollars in the current economic environment for these sorts of purposes. That outlook may change between now and 2015 when these date-setting decisions will be made, but don't place any wagers on that just yet. That dilemma, if it was even a dilemma, did not seem to affect the calculus in North Carolina recently. The General Assembly in the Tarheel state charged ahead with the primary change with little or no mention of the estimated $4 million price tag of a separate presidential primary. 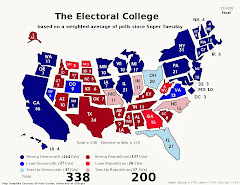 Still, as FHQ has shown, one of the primary determinants of state movement -- or non-movement in this case -- in the post-reform era has been whether a state holds its presidential primary concurrently with the primaries for state and local offices. Those with consolidate primaries have been much less likely to move. Given those constraints, what is the RNC to do if the end goal is a June convention? Well, it can press forward of course. But the party is very likely to find some resistance, more so from states than state parties. If that is what happens -- the RNC moves on this initiative and finds widespread state-level resistance to the idea -- the only move left at the national and state parties disposal at that point is to transition from a non-compliant consolidated and late primary to earlier and compliant caucuses. ...but that conflicts with another recommendation in the GOP Report: "discouraging conventions and caucuses for the purpose of allocating delegates to the national convention". But the caucus route may be the only one open to the RNC in a number of late states because of partisan or structural complications. 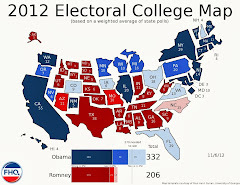 However, that would mean the addition of as many as ten or eleven new caucus states; an increase of around 100%. That opens the door to a number of unintended consequences that possibly exacerbates any rift in the party or reverses the inroads made toward cooperation. A June convention is an uphill battle. Even late July seems tough given the apparently required 60-90 day window. 1 The partisan picture is similar in New Jersey minus Democratic control of the governor's mansion. But a party potentially needs to have unified control of the legislative and executive branches to make these primary moves happen.